Garden Walks Reviewed by Edgeville Buzz on June 15, 2009 . 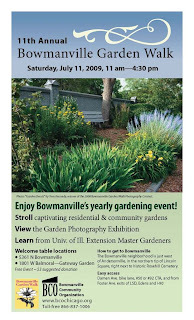 July 11: More than 20 gardens are on the Bowmanville Garden Walk on the North Side. Hours: 11 a.m. to 4:30 p.m. Cost: $3. Maps at 5361 N. Bowmanville Ave. or 1801 W. Balmoral Ave. Information, 866-837-1006 or BCOChicago.org. July 12: East Edgewater Glen Garden Walk will include flower and vegetable gardens, beginning at 1420 W. Glenlake Ave. Hours: noon to 5 p.m. Cost: $4; children free. Call Kim Kaulas, 773-761-3668.